by Masaharu Morimoto (DK Publishing, 2007). It is best to cut up the lobsters after you have prepared all the vegetables. Preheat the oven to 400?F (200?C). Wrap the beets in foil and roast for 45 minutes, or until tender. When they are cool enough to handle, rub off the skins and halve or quarter the beets. Peel the carrots and trim to leave about ½ inch (1 cm) of the green stems. Bring a large saucepan of lightly salted water to a boil. Add the carrots and cook for about 4 minutes, until just tender. Drain and rinse under cold running water. Trim the asparagus to include the tips and about 4 inches (10 cm) of the stalks. Use a swivel-blade vegetable peeler to trim off the tough skin from the thicker part of the stems. In another saucepan of boiling salted water, cook the asparagus and broccoflower until just tender, about 3 minutes. Split the lobsters lengthwise in half down the belly. Using a teaspoon, remove the dark “sand sack” from inside the head; this is the only part of the lobster that is not edible. Separate the claws with a heavy knife. If not cooking immediately, wrap and refrigerate for no more than 2 hours. The sooner you cook the lobsters, the better. Heat 2 tablespoons of the olive oil in a very large skillet, meat side down, arranging the claws flat against the surface of the skillet. (If the lobsters don’t fit, use 2 skillets or cook them one at a time.) Sauté until the tail meat is golden in color, 2 to 3 minutes. Turn the lobsters over and season the exposed meat of the lobster generously with 2 tablespoons of Morimoto Special Spice. Add additional oil and cover the skillet. Cook until the lobster tail meat is opaque when pierced and the shells are bright red, about 3 minutes. Remove to a platter or large plate. The claws will take 2 to 3 minutes longer. Tent the lobsters with foil to keep warm. Repeat with 2 more tablespoons of oil, the remaining 2 lobsters, and 2 more tablespoons of Morimoto Special Spice. Heat the remaining 2 tablespoons of olive oil in the same skillet. Add the cooked beets, carrots, asparagus, and broccoflowers. Toss over medium-high heat for a couple of minutes to warm through. 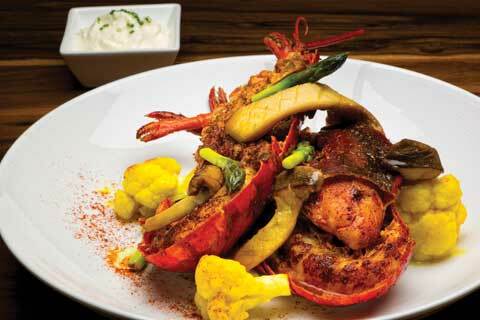 Arrange the vegetables around the lobsters and serve with the lemon crème fraiche on the side. Bloom gelatin in ice water. Combine H2O and lemon juice in sauce pot. Add sugar. Heat liquids only until sugar is dissolved. Do not boil. Whisk in gelatin. Whisk liquids into crème fraiche & chill. Combine all of the ingredients. Store in a covered container in a cool, dark place for up to 3 months.